Can you guess which headline took the top spot? H.R. 4164 (now H.R. 5405) – This legislation remains in committee, and had been sitting on the back-burner with its authors awaiting an opportunity to add it a larger bill. This opportunity arose just last week as it was added to a larger reform bill, H.R. 5405, by Rep. Mike Fitzpatrick (R-PA) and others. The legislation proposes to effectively de-mandate the XBRL filing for all “small” public filers, those whose market cap is less than two-hundred and fifty million dollars annually. Congressional leaders such as Representative Carolyn Maloney (D-NY) have come out strongly against limiting open data requirements, stating, “We have to move forward not backward on XBRL.” Additionally, many have shared about, (i) the quality of XBRL data improving (and will so even more with SEC enforcement); (ii) the need for a complete data set to be able to harness the potential of the data; (iii) how the data is being used by investors now; and (iv) the potential of the standard in improving transparency should it expand to other sectors. More about how XBRL can be helpful to the investor and public filers now. More about the potential for XBRL in other sectors. Peer benchmarking was highlighted by Merrill Corporation and Calbench, noting that, “A great company is always pushing to keep ahead of its competition. To aid in this effort, a top-tier finance team should collect and analyze available data, not just to measure how the company is doing in comparison to its peers but also to see what insights can be learned by examining competitors’ strong and weak points. Until recently, this kind of data-driven peer benchmarking was a slow, tedious, error-filled process, involving hours wasted digging data points out of SEC filings. For this reason, many finance professionals avoided doing it altogether, but thanks to XBRL, the situation is changing fast.” You can read the entire article here. Rank and Filed showed clearly and concisely that XBRL is both useful and understandable. “It is promising to see an illustration that XBRL can be the useful, comprehensive, accurate, and understandable standard that was expected.” Read more here. CompSci Resources offers XBRL audit|pro; this is a web-based XBRL quality assurance tool that works directly with the HTML to ensure completeness, consistency, mapping, and structure (per AICPA and EFM guidelines). Calcbench offers the “Filer Portal” to give filers insight into how they can improve their XBRL filings; and Calbench also provided this reporton data quality. Uptick in Reporting by Data Quality Watchdogs – Corresponding with the uptick in data quality tools, some organizations have made waves by reporting on the quality of XBRL filings. Many of these focus on common errors, and demonstrate that many of these errors can be fixed quickly by giving a small amount of attention to reviewing the filings. This is significant as it dispels a common misconception that the filings are so riddled with errors that they are not close to being useful. Tagnifi has published a few articles to this effect, as have Calcbench and 9-WSearch. Additionally, Rank and Filed allows everyone quick, understandable access to all twenty-five million documents that are publicly available on the EDGAR database. As such it simplifies the identification of filing anomalies as users can review consecutive quarterly and annual filing data side-by-side. Many articles and blogs have been written drawing insight from this. CFO’s at many public filers were likely asking exactly what an XBRL calculation was. It was also easy to see that the XBRL community welcomed the SEC publicly showing an interest in XBRL quality, and sharing the specific way in which they were going to be assessing XBRL filings. The most promising impact in the aftermath of this letter is that filers are now in turn more incentivized in ensuring the quality of their XBRL, not just getting it done to satisfy a requirement. Stepped-up enforcement by the SEC will only accelerate the quality improvements, and will give investors and filers alike the ability to use XBRL in more meaningful ways. Quality will become the decision-making focus, and finding a knowledgeable, industry-leading software and services vendor will become more important than just getting a zip file with six files with the proper extensions uploaded to the SEC on time. 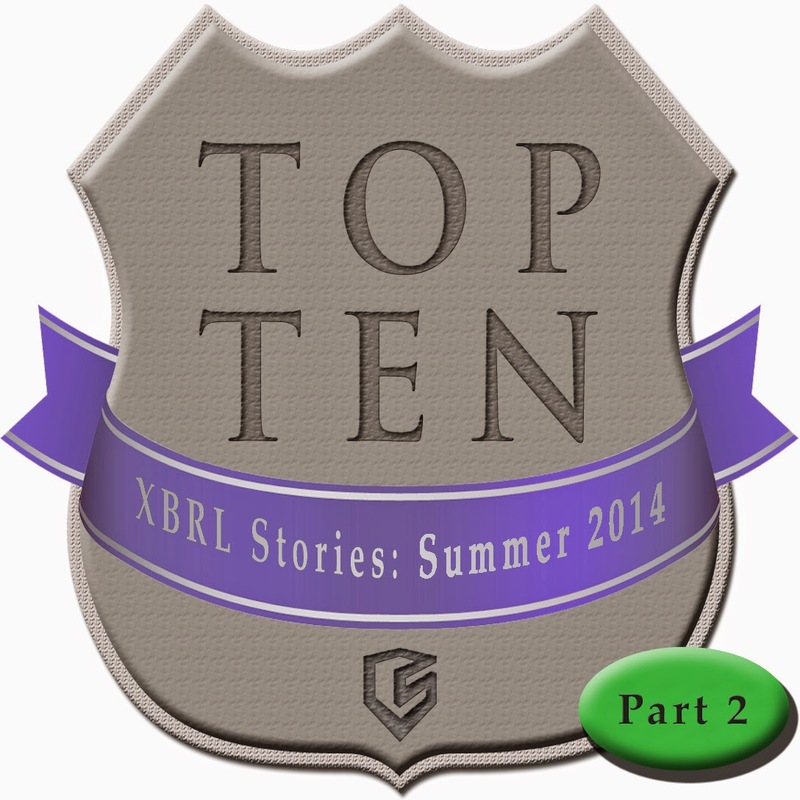 This completes one list of the Top 10 stories for the XBRL community in the Summer of 2014. What do you think? Did we get this right? What else deserved additional attention? AQM: What is it looking at?